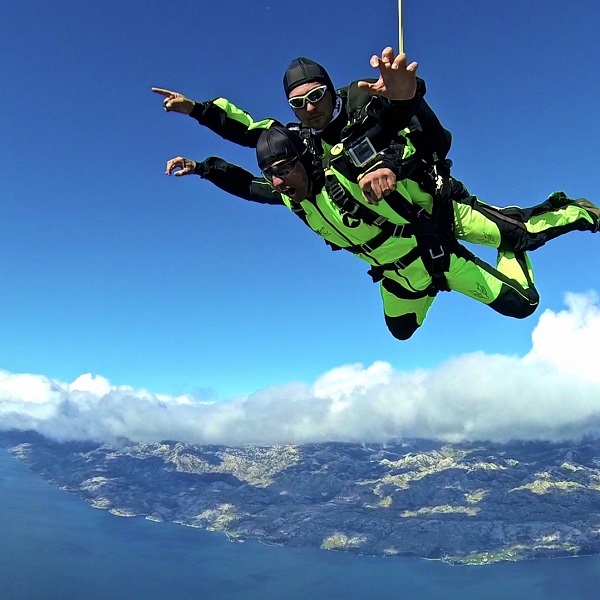 Tandem skydive jumping allows you to enjoy all of the thrill and excitement of free falling on your very first skydive jump! We specialize in first timers and it is very special moment to all of our staff, to be able to share your first skydiving rush with you. Training for your first skydiving tandem jump will take about a half-hour, depending on how many questions you have :). we will take all the time needed to train you, and to answer all of your questions. Your tandem skydiving instructor will be your silent partner, letting you have full control; or you can just lay back and enjoy the ride. Since we’re weightless in free fall, you won’t even notice that your tandem skydiving instructor is there. We will be skydiving from up to 3500 meters AGL (Above Ground Level), we’ll free fall at 200 KM/H – 280 KM/H for up to 50 seconds. While we free ride the wind, we can do controlled canopy turns, speed diving and burn up the sky. Then, with a quick pull of the ripcord, we’ll enjoy a quiet and peaceful 5 – 7 minute parachute training flight. You’ll learn equipment safety, free fall body position, canopy control and landing patterns, all with your tandem skydiving instructor acting as your flight instructor. If you book your flight on time you can expirience tandem skydiving sunset load. This is skydiving jump in sunset simply that. This is maximum that you can get because Zadar is known also as location with most beautiful sunsets in the world. Spectators are welcome to watch the tandem skydiving jumps. – ….and many, many other kind of interesting and creative surprises. Basic accommodation like apartments, 2* hotels, hostels, camps. Public transport. Mostly self-catering. Some hiking or cycling on higher altitudes or more strenuous activities like rafting, but suitable for all healthy travellers.